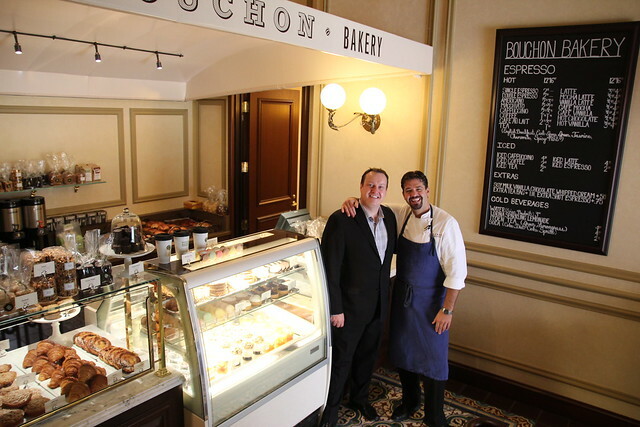 Bouchon General Manager Stephen Cook and Chef de Cuisine Rory Herrmann. The much anticipated Bouchon Bakery Beverly Hills opens to the public tomorrow, August 17, but I (along with other media types) was granted a (hosted) sneak peek to this French pastry paradise today. 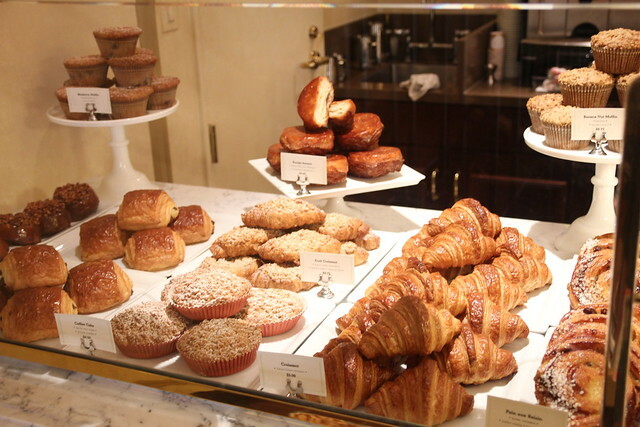 Situated at the lower level of the grand entrance to Thomas Keller’s Bouchon restaurant (talk about impulse buys) in Beverly Hills, the bakery is not the place to grab and go. No, here, you really want to savor everything a la Francais and sit on the lawn out front in the Canon Gardens Plaza to enjoy the many layers of your Kouign-amann (“butter cake”), Bouchon Bakery’s signature pastry, and your cup of Equator coffee, specially blended for Bouchon of course. I didn’t get a chance to do that today since I was late for work but from now on I’m gonna make time. Reminiscent of a Parisian patisserie, Bouchon Bakery Beverly Hills showcases its baked goods in a mouth-watering display of chocolate croissants, sticky buns, and muffins. Yogurt parfaits, tarts and pastel macarons decorate the center refrigerated case. You may feel a bit overwhelmed by all the enticing choices but the counterperson will be glad to offer suggestions. Bouchon Bakery counterperson suggests I take these croissants. Chef de Cuisine Rory Herrman raves about the Nutter Butter which is comprised of two peanut butter biscuits sandwiching the creamiest peanut butter there ever was. The counterperson concurred saying that this treat actually makes her giddy. She even did a little dance as she bagged one for me. And after one bite of the cookie, I had to agree. That crispness of the biscuit gives way beautifully to that peanut buttery whipped heaven. Zowie. That Kouign-amann (kwin-amahn) — a pastry that originated in Brittany, France — is a unique and hard-to-find treat that, out of the other four Bouchon Bakeries, is only available at this Beverly Hills location. And it can’t even be found in most patisseries in Paris because it’s so difficult to make. Basically, it’s a cross between a croissant and a Palmier cookie with a shiny glazed exterior and many bready layers. “The butter and sugar between each layer allow it to rise so you still get that flakiness but in between all of that you get the sweetness, too,” said Herrman who swears this isn’t too sweet for breakfast. I shared some with my co-workers and they looooved “that layer thingie.” One co-worker said he wanted to insert slices of cheese between its buttery layers. He crazy…but ingenious. The yogurt parfait is insanely decadent. I see this more as a dessert than a breakfast item because its fruit compote mixed with the crème fraiche/Greek yogurt sent me deep into the sugar blues. Rendering me useless in the morning at work. But maybe if you just have this alone and not as a follow-up to the Kouign-amann, Nutter Butter and chocolate bouchon, you’ll be OK. Warning: You may feel compelled to lick the screen. The new Bouchon Bakery Beverly Hills will definitely be a required morning stop for me on my way to work. There’s lots of metered street parking or you can park in the garage (2 hours for free). But again, I have to make sure I allow enough time to just linger and ease into the day with a chocolate croissant and cappuccino. By the way, they also have sandwiches and salads created by Herrman for lunch. Think smoked salmon on black sesame Kaiser roll ($8.50) and a $9 salad with mixed greens, herbes de Provence and goat cheese. i am so jealous of you! that Kouign-amann sounds incredible i can’t wait to try it! I’ll definitely have to check this out. Thanks for the detailed and appetizing sneak peek! Had the kouign-amman last weekend. two of them actually. 🙂 ridiculously good. The only other place I’ve seen it is at Honore Bakery in Seattle. We moved our offices across Beverly Drive from Bouchon on the 19th, and the bakery was one of my first stops. OMG, everything is so good, and I’m trying to limit carbs. The sandwiches are pretty good too, with to-die-for bread, particularly the turkey and cheddar on walnut baguette. 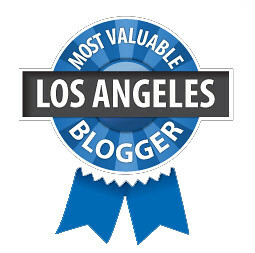 Thanks again for a great blog!